“And it came to pass that Alma ate bread and was filled; and he blessed Amulek and his house, and he gave thanks unto God” (Alma 8:22). After Alma had faced rejection at the city of Ammonihah, an angel commanded him to go back (Alma 8:8–18). Upon his return, Alma was received by Amulek, who was commanded by an angel to receive him into his home (vv. 19–20). Amulek “received him into his house … and he brought forth bread and meat and set before Alma” (v. 21). 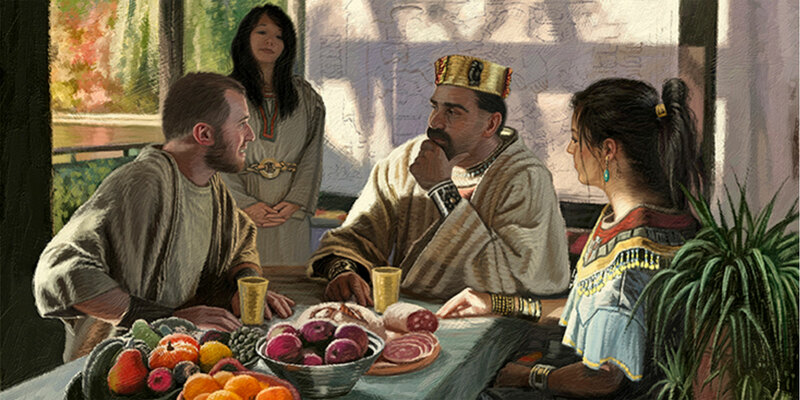 After eating the meal set before him, Alma “blessed Amulek and his house, and he gave thanks unto God” (v. 22). Against this background, it is clear that Alma the high priest pronounced a blessing upon Amulek and his household because Amulek had fed and filled him. Alma, having generously received, offers a generous blessing in return. In contrast, it is interesting that, in a later Jewish story, “when Rabbi Zadok ate only a small portion of food, he didn’t say the blessing afterward, probably because Deuteronomy 8:10 calls for a blessing only if one has eaten and is full.” The Book of Mormon specifically says, “Alma ate bread and was filled” before he gave his blessing (Alma 8:22). As the High Priest, Alma showed here his ample awareness of the law in Deuteronomy. In Deuteronomy, blessing the Lord after “thou hast eaten and art full” is mentioned as an expression of gratitude for leading the Israelites “into a good land” (Deuteronomy 8:7–10). For Alma, the expression came after the Lord had led him to Amulek, allowing Alma to find a safe haven in a land which had previously rejected him (Alma 8:14–22). In both settings, the blessing is an expression of gratitude and thanks for the Lord’s blessings of safety and prosperity. Moreover, Alma’s blessing anticipated the time when the Lord would bestow a blessing after a messianic meal. The Savior followed a similar pattern during his first day among the Nephites at the temple in Bountiful. As the sacrament was administered to the people there in 3 Nephi 18, “they were filled” (v. 9), after which Jesus “blessed” them (vv. 10, 14). He then taught them to keep the Father’s commandments and to pray always to the Father in the name of Jesus Christ (vv. 14–20), so that their wives and children “may be blessed” (v. 21). Finally, on the next day, the sacrament was again administered unto the people, and they “were filled with the Spirit; and they did cry out with one voice, and gave glory to Jesus, whom they both saw and heard” (3 Nephi 20:9). Following that, the Savior went on to confirm in even richer abundance a host of blessings upon the people. These included: that the Father had given them their land for their inheritance (v. 14) and that God will establish and bless his people with his presence (v. 21–22). He also gave them the blessing of Abraham by which “all the kindreds of the earth [shall] be blessed” (v. 25). Jesus then further “bless[ed them] in turning away every one … from his iniquities” (3 Nephi 20:26), and after being so “blessed,” the people were ultimately “blessed—unto the pouring out of the Holy Ghost” to make them mighty through the fullness of the everlasting gospel (v. 27). It is possible that Mormon recognized the similar pattern found in 3 Nephi 18 and 20 and took delight in retaining this seemingly insignificant detail in Alma 8:22 as an allusion to the messianic pattern. Angela M. Crowell and John A. Tvedtnes, “Notes and Communications—The Nephite and Jewish Practice of Blessing God after Eating One’s Fill,” Journal of Book of Mormon Studies 6, no. 2 (1997): 251–254. Michael Berenbaum and Fred Skolnik, eds., “Grace after Meals,” Encyclopaedia Judaica, 2nd edition, 26 vols. (Detroit, MI: Macmillan Reference, 2007), 8:22. Angela M. Crowell and John A. Tvedtnes, “Notes and Communications—The Nephite and Jewish Practice of Blessing God after Eating One’s Fill,” Journal of Book of Mormon Studies 6, no. 2 (1997): 252. Examples are mentioned in Crowell and Tvedtnes, “The Nephite and Jewish Practice of Blessing God after Eating One’s Fill,” 252. For the dating of Jubilees, see O. S. Wintermute, “Jubilees (Second Century BC): A New Translation and Introduction,” in The Old Testament Pseudepigrapha, ed. James H. Charlesworth, 2 vols. (Peabody, MA: Hendrickson, 1983), 43–44. Crowell and Tvedtnes, “The Nephite and Jewish Practice of Blessing God after Eating One’s Fill,” 252, emphasis added.